An excellent all-around 8000 watt generator for homeowners. The Generac 8000 Watt Generator comes in three different models. They all share the same features. We put together this guide to help you decide if this is the right portable generator for your needs. A generator can be used in many different situations from powering up your home or electrical appliances in an emergency or for camping trips. Some occupations even rely on portable generators as a power source for tools while working on job a site. 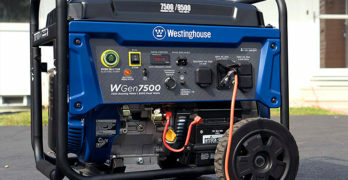 No matter what the need is, if you’re looking for a generator there are some factors that you’ll need to keep in mind. First and foremost you should know that generators come in a vast selection of sizes and types. Some are portable while others are meant to power an entire home or even a business building. The average consumer in the market for a generator will likely be looking for something more within the range of a portable unit. Keep working day or night. Let’s discuss wattage for a moment. When you are shopping around and looking at different models and types of generators one of the first things you’ll notice is that they go by wattage. This label indicates the maximum amount of power it will put out. You’ll also see a wattage reference that is labeled as ‘rated’ which is typically about 90% of the generator’s maximum output and will give you longer run-time at that consumption. The generator size you need will vary depending on the intended use and how much power the appliances you’ll be running it on take. Appliances that run on an electric motor will require more wattage to start up. Let’s say you’re looking at running larger electrical appliances such as a refrigerator or air conditioning units (window). You would need a generator size of at least 2,500 – 4,000 watts to run those appliances alone. When you’re looking at the wattage, also be mindful of the running watts vs. starting watts – most electrical appliances require higher starting wattage. This is what you need to keep your home running during a power outage. Another important consideration when looking at generator sizes is the distinction between portable vs. stationary generators. Stationary generators are larger units intended for powering up an entire house or building. These can range in power from 5,000 – 20,000 watts and are much more expensive. These should be installed by a professional. Portable generators are much more common for typical use given the fact that they can conveniently provide power where you need it. Portable generators range in power providing 3,000 – 8,500 watts and typically cost between $400 to $1,500. Generac generators are the leading brand in portable generators due to their innovation and top notch quality. A distinctive trait in Generac generators is the engines that they operate on. The company is one of the few that manufactures its engines in the U.S. specifically for generator-use as opposed to cross-over lawn mower motors that other companies use. More specifically, Generac 8000 watt generator engines in their XP series is one of the few in its class that are not sourced from China. Connect your Generac 8000 Watt Generator to your transfer switch. For the purpose of this article we’ll be focusing more on 8,000-watt generators as a generator this size will power up most of your basics and then some. Most users who are looking for a generator do so as a means of a backup power alternative in the event of a blackout or for powering up a camper. Many homeowners will be able to power up a majority of their appliances on 3,000 to 6,5000 watts, not including their water/heating/air conditioning systems. Recreational – RVing, tailgating, etc. An 8,000-watt portable generator should be plenty sufficient to power an RV with no problem. This, of course is subject to the wattage consumption of the air conditioner system, which is the primary appliance that will be running on the generator. Tailgaters that don’t want to kill the battery of their vehicle would also find use in a portable generator for powering up a small television, radio, laptop computer and much, much more. Contractors and those who work in construction frequently use power tools for the job. These often consist of tools that require electricity to run, which may not be readily available on the job site. A large construction crew that is using many different power tools simultaneously will greatly benefit from using a Generac 8,000 watt generator to get the job done more efficiently. Even farmers and those that work in agriculture can rely on generators. Now this question depends on how useful a generator would be to you. Do you live in an area that is prone to blackouts, particularly during a specific time of year? Consider how much food and money wasted from having to throw out cold items each time you lost power for a prolonged period of time. Depending on the time of year, you could find yourself faced in a very uncomfortable and even dangerous position without a source for heat or air. The same could be said for those who enjoy spending time in the great outdoors RVing as well. Portable – Unless you have multiple large appliances in a large house you wish to run, a portable generator is usually all you really need. These are normally equipped on a housing frame with wheels that can easily be transported from one area to another or for easy storage. Portable generators offer much more versatility and value than a stationary unit. Electric start – If you don’t want to deal with the hassle of a traditional pull-string generator be sure to look for one that offers an electric start feature. These will also power up much faster in harsh climates where the recoil starter method requires greater effort. Automatic low-oil shut off – this is a feature that serves to protect the generator’s motor when the oil in the reservoir drop below the minimum required levels by shutting the unit down. This is a standard feature that most of your modern portable units come equipped with today. A generator is not cheap and it requires maintenance. If you want to avoid throwing your money away be sure to keep it well maintained and running adequately. Fuel Gauge – This is a really valuable feature to ensure you don’t end up left in the dark as a result of running out of fuel. A gauge lets you know how much fuel is left in the tank so you aren’t left to guess how much time you have left before needing a fuel up. Raw Power For: construction sites, natural disasters, and power outages. Generators are powered by fuel, which means it will emit exhaust to some extent and that can have a negative impact on the environment. Often times you will see a label CARB-compliant on fuel-powered tools. This stands for California Air Resources Board and indicates that the unit is specifically designed to meet the standards set forth by this board to reduce the output of damaging emissions. In the state of California and many other states, it is required that large power tools such as generators meet the CARB-compliant rules and regulations. Most manufacturers offer a CARB-compliant model that is equivalent to their regular generators. If you live in a state that bans NON-CARB compliant motors you will need to ensure the model you opt for indicates that it meets those standards. Now that we’ve covered some of the basics, let’s take a look at some recommended generators that will likely fit most needs. The first two are Generac 8000 watt generators within their XG 8000 series line. ✓ Introducing the Generac 8000 watt generator…The Generac 5846 is CARB-Compliant and the Generac 5747 IS NOT CARB-Compliant. If you live in California and/or you care about the environment then you’ll want to purchase the Generac 5846 model. 10,000-Watt peak and 8,000-Watt running power. 9 Gal. fuel tank runs the generator continuously for up to 10 hours. 410cc OHVI engine runs on gasoline for high performance. Four 20 Amp receptacles and 1 L14-30R receptacle. PowerBar easily monitors power wattage. View or download the MAINTENANCE SHEET. One of the biggest features that must be noted is Generac’s OHVI engines which are comprised of a full-pressure lubrication system that features automotive-style spin on oil filter that serves to extend the life of the engine. Most generators use a splash delivery system, however, Generac’s innovative design in this aspect further ensures long-lasting quality for a reliable machine that won’t leave you disappointed. Additional features that help preserve the engine life are maintenance reminders and low-oil shutdown. A nice added bonus with this model is that it comes with its first oil and maintenance kit. This generator provides covered outlets to protect them from environmental factors as well as circuit breakers, a feature not found on many models. Excluding the battery charger outlet, there are 5 electrical outlets in total with a 120/240v 30 amp Twist Lock outlet. It has a very user-friendly console with engine controls that are convenient for a simple start up. In terms of durability, this one is pretty hard to beat with a solid frame that is actually thicker in diameter compared to other units by 25% to withstand rugged conditions like construction sites. CARB-Compliant version. Same features but fewer emissions. What sets this generator apart from the previous model, aside from the CARB-compliance, is the noise level it puts out. This powerful generator is relatively quiet in comparison to others in its class. A 9-gallon capacity fuel tank provides long lasting run-time when operating at 50% to sufficiently power a mid-sized RV or your essential appliances in the event of an emergency. As standard in the models within the XP series, this Generac 8000 watt generator delivers the same level of quality with features intended to prolong the engine life such as the spin on pressurized oil lubrication system, automatic shut-off feature when the oil level gets too low and the rugged durability of the frame. Additionally, the handle makes transporting the portable unit more convenient and folds down compactly for storing. Learn more about CARB-Compliance from the California Air Resources Board (CARB). 9 hour run-time (at 50% load). Metal 7 gallon fuel tank for increased durability and less refueling. Power Surge energy produces a short surge of power needed to start large motor-driven appliances and tools simultaneously. Quick and easy starting right from the control panel. Easy, All-Terrain Maneuverability : 12” Never Go Flat wheels and a fold-up handle. Briggs & Stratton Engine (420cc). Excellent fuel efficiency. Key Electric Start and remote choke. Hour meter to monitor run-time. An added feature on this unit for the purpose of preserving the integrity of quality is the rubber outlet covers that are included which prevent outlet corrosion from occurring. The outlets are protected with circuit breakers to protect both your appliances and the generator from overload. For convenient mobility, the wheel kit included with this unit features 12-inch Never-go-flat wheels that can handle any terrain. It is also backed by a 3-year limited warranty from the manufacturer. As for the noise level, it’s about average as far as generators go. It has been noted that it is louder than some brands (Honda) but, relatively quieter in comparison to the Generac 8000 watt generator models. It is a generator — if it’s not making some level of noise then it isn’t working. What more can I say? Fantastic generator for the money. Fuel tank capacity: 8.3 Gallons. Quiet exhaust with built-in spark arrestor. Cast iron sleeve and steel bearings for increased durability. 12-Volt battery for electric starter. Large 10.5” never flat tires. View or download the MANUAL for the DuroMax XP10000E. This powerhorse offers a really good deal for the power capability and fuel efficiency compared to other models of similar power. An important note is that it is EPA-approved but not CARB-compliant. There is a CARB-compliant version that is equivalent to this one in power (XP10000E-CA) for residents of California. Affordable power for emergencies, work and outdoor fun. 8.3 Gallon Gas Tank / EPA Approved. A generator is a very useful machine that can be quite helpful in emergency situations, but safety should always be a priority when it operating one. Keep the following safety tips in mind when using a generator of any type (including CARB-compliant models). Keep portable generators at least 15-feet away from your home, doors and windows and only operate outdoors. Add a fuel stabilizer to the gas when it is not in use. Always uncoil cords and lay flat to reduce fire hazard as coiled up cords can become very hot. Install a Power Transfer Switch (by a professional) or an interlock device (cheaper DIY alternative) to connect the generator to your home for backup power. Keep your generator protected from exposure to rain and snow. Keep your generator properly secured from children. Use in enclosed places like a closed garage or indoors. Generators emit carbon monoxide which can build up and become very dangerous and potentially fatal. Even those that meet CARB standards still emit fumes to a degree. Install a battery-powered carbon monoxide detector nearby the area where the generator will be running. Operate near materials that are flammable or combustible. Plug a generator directly to your home outlet. This can cause serious damage to your appliances and the generator as well as put utility workers at risk for injury. Operate the generator in wet conditions. These machines produce very powerful voltage which doesn’t mix well with water. Believe it or not, the user manuals are there for a reason – to ensure safety and help extend the life of your model with proper care and maintenance guidelines – so READ IT!